No-reflow is one of the major complications of primary percutaneous coronary artery intervention (pPCI) in the treatment of acute ST-segment elevation myocardial infarction (STEMI). Fibrinogen-to-albumin ratio (FAR) has currently emerged as a novel inflammatory marker to predict inflammation in chronic diseases. This study aimed to investigate whether admission FAR values predicts angiographic no-reflow and short-term prognosis in all STEMI patients. A total of 510 consecutive STEMI patients who underwent successful pPCI between September 2016 and May 2018 were included in this study. Patients were divided into groups based on thrombolysis in myocardial infarction (TIMI) flow grades after pPCI. No-reflow was defined as a post-PCI TIMI flow grade of 0, 1, or 2. Angiographic success was defined as TIMI flow grade 3. Fibrinogen, hs-CRP, and admission FAR values were significantly higher among patients with no-reflow. On multivariate analysis, admission FAR was an independent predictor of angiographic no-reflow (p < 0.001). Receiver-operating characteristics analysis revealed the cut-off value of admission FAR was a predictor of no-reflow with a sensitivity of 79.59% and a specificity of 69.42%. 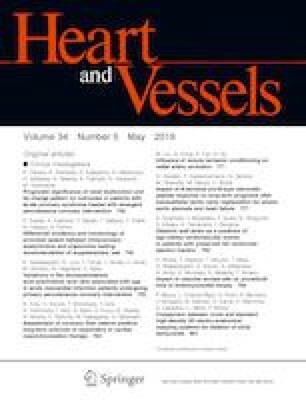 In multivariable Cox regression models adjusted for potential confounders, admission FAR values, and LVEF, hs-CRP was independently and positively associated with the 30-day all-cause mortality. Admission FAR was associated independently and significantly with angiographic no-reflow and short-term mortality in patients with STEMI undergoing pPCI. Yipin Zhao and Jiaojiao Yang contributed equally to this paper and as co-first authors.